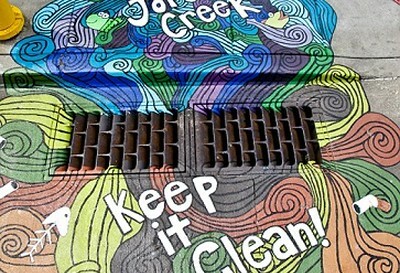 Stormwater drains are one of the most overlooked public landmarks, but the City of Richmond Department of Public Utilities (DPU) has a plan to bring attention to them in a fun and creative way through its Storm Drain Art Project, part of the city’s RVAH2O program. Stormwater is runoff from rain or snow that can’t be absorbed through surfaces like driveways, parking lots, roads, sidewalks or roofs. 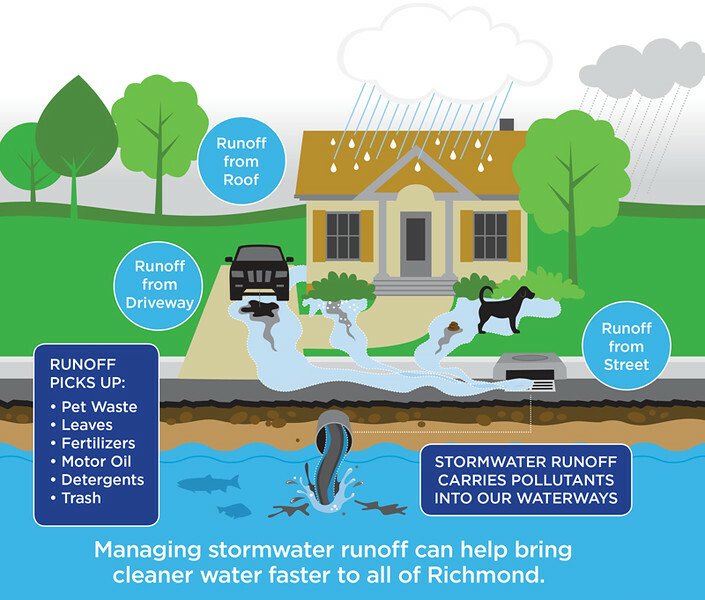 As water travels over these surfaces, it may pick up dirt, trash, oil, grease, pesticides, fertilizers, pet waste and other pollutants, carrying them into Richmond’s waterways. Stormwater is the number-one source of surface water pollution in the nation according to the U.S. Environmental Protection Agency. Using public art to bring attention to social issues is a medium that offers an opportunity to cut through the noise and powerfully resonate an often overlooked message. 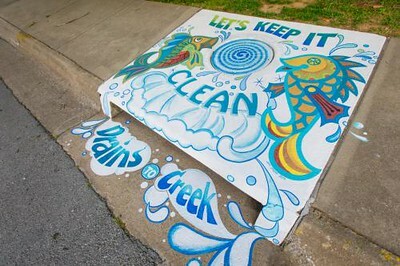 The goal of the Storm Drain Art Project is to raise awareness about the importance of clean streets and waterways by creatively delivering the message that various pollutants enter the James River (and ultimately the water supply) through storm drains. Five artists will receive a stipend to paint drains along Tredegar Street in downtown Richmond. The City of Richmond Department of Public Utilities is at the forefront of a collaborative, grassroots, long-term public-private partnership to develop an action plan to bring cleaner water to the residents of Richmond, VA. This effort (RVAH2O) includes a four-year process to seek an innovative permit granted by the EPA’s National Pollutant Discharge Elimination System (NPDES) program. Richmond would be one of the first cities in the U.S. to receive such a permit, which will allow for the efficient combination of addressing efforts regarding drinking water, waste water and stormwater to deliver cleaner water faster.